Andrew Montan, Marketing Director at Comet USA, talks about working with Nimlok Minnesota. Comet USA is an American distributor for the Italian high pressure plunger pump manufacturer, Comet Spa. Comet USA specializes in high pressure plunger pump applications ranging from consumer markets up to commercial and industrial markets. Comet USA planned to exhibit at multiple shows throughout the year and needed a budget-friendly modular exhibit solution that would help increase global brand presence and illustrate capabilities to prospects on the show floor. Comet USA collaborated with expert Nimlok dealer, Nimlok Minnesota, to design an impressive 20’ x 20’ island exhibit that could be modified to fit a 10’ x 20’ inline space. The 20’ x 20’ configuration made use of an exhibit-spanning fabric banner decorated with Comet USA’s logo which helped to increase global brand presence on the trade show floor. Comet USA’s staff took advantage of the exhibit’s open layout to consult with attendees, educating them on products and capabilities. The 10’ x 20’ layout scaled-down the exhibit without sacrificing branding or product education opportunities. A fabric graphic backwall displayed product imagery to communicate brand messaging and capabilities effectively to visitors in a friendly and inviting environment. 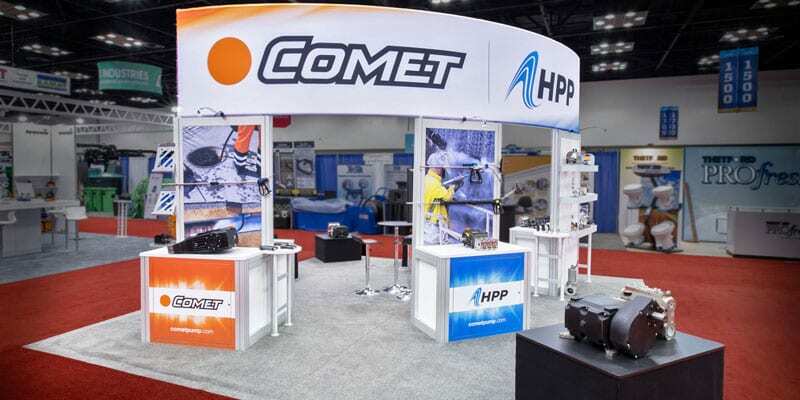 By having a modular exhibit solution, Comet USA was able to reduce their exhibiting costs while maintaining a robust trade show program that allowed for flexibility in both design and event selection.